There's more than a boardwalk and a long, wide beach at the Virginia Beach oceanfront. It's a vacation resort with an amphitheater, good restaurants, night clubs, fun amusement parks, an aquarium, quality golf courses and truly special events. Come to Virginia Beach for all kinds of fun. There must be a hundred hotels, motels, inns and other lodging in Virginia Beach. There are oceanfront hotels and motels a block off the beach. North end hotels and south end lodging. There's even a hotel in the new Virginia Beach Town Center and a historic hotel on a hill. How do you choose just one? We're here to help! Go to our reviews to find the best deals on Virginia Beach oceanfront hotels. Hotels aren't the only lodging option for your visit to the beach. Virginia Beach has hundreds of vacation homes available for rental. You'll find rentals in each area of the beach, including the north end, ocean front strip, Croatan Beach, and Sandbridge Beach areas. 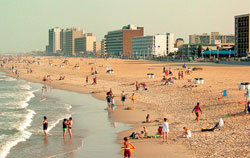 Start your search for the perfect rental with our Virginia Beach vacation rentals page. Fort Story - 89th Street. Public beach open on weekends. Lots of sand and good surf. Free parking and restrooms available. North End - 42nd Street to 88th Street. Residential area with lesser crowds. Very limited parking, and don't park illegally or you will be towed. Croatan - Croatan Road, off General Booth Blvd, south of Rudee Inlet. Public parking area and a designated surfing area. Little Island Park - Sandbridge Beach, far south of the tourist beach. Amenities include public parking, basketball courts, concessions, fishing pier, picnic shelters, playground equipment, restrooms, surfing/swimming, tennis courts and volleyball courts. False Cape State Park - In the extreme southeast corner of Virginia Beach. It has 6 miles of undeveloped beaches, 12 campsites, and 9 miles of hiking/biking trails. You can't get there by car; you have to hike, bike or boat in. Metered on-street parking is available throughout the resort area. A fee of $0.75 per hour is charged. Municipal parking lots are located on Atlantic Avenue at Rudee Loop and 4th Street, on Pacific Avenue at 19th and 25th Streets. The maximum fee is $7 per day. Municipal parking garages are located between Atlantic and Pacific Avenues on 9th and 30th Streets. The maximum fee is $7 per day. The Virginia Aquarium and Marine Science Center is the state's largest aquarium and represents the marine environment in two buildings with over 800,000 gallons of aquariums and live animal habitats, and more than 100 hands-on exhibits. Sharks, sea turtles, harbor seals, stingrays, river otters and more. Ocean Breeze waterpark has 16 waterslides, an inner-tube course and a million gallon Runaway Bay wave pool. Paradise Pipeline, Hurricane, Coconut Drops, Bamboo Shoots, Jungle Falls, Largo Loop, Mat Slides, Pirates Plummet. Activities and slides for small children too. Motor World is your place to race in Virginia Beach. 11 go-kart tracks and 16 styles of go-karts to choose from. The Adult Speed Track is new. Also the Splat Zone paintball fields. 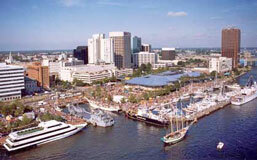 Take one of the Virginia Beach dolphin watching or sunset cruises. First Landing State Park is a big beautiful natural area located on the Chesapeake Bay side of Virginia Beach. Trees are draped with spanish-moss. 19 miles of biking and hiking trails, picnic areas, cabins and camping. Big name concerts come to the Virginia Beach Amphitheater. It's big ... 7,500 reserved seats under the pavilion roof and room for 12,500 on the "festival lawn". The sound is excellent and the outdoor atmosphere can't be beat. For a list of concerts at all area venues, please see our concert calendar. Golf Virginia Beach has descriptions of the TPC, Cypress Point, Hells Point, Heron Ridge, Honey Bee, Red Wing and other local golf courses. Virginia Beach's courses will keep the enthusiast busy and happy. Be sure to visit one of the big surf shops at the oceanfront. Boards and wetsuits for the surfers, and t-shirts for the rest of us. Cool. Try 17th Street Surf Shop (17th and Pacific) or Wave Riding Vehicles (1900 Cyress Avenue). Do you dream of a home near the ocean? See our exclusive guide to new developments in Virginia Beach real estate. Don't miss our guide to Virginia Beach condos, they're extremely popular for rentals or for buying. The official City of Virginia Beach. Check the Virginia Beach weather forecast. The Eastern Shore is across the Chesapeake Bay Bridge-Tunnel from Virginia Beach. The official Virginia Beach Tourism website.